Want to combine multiple seismic attributes into one display? 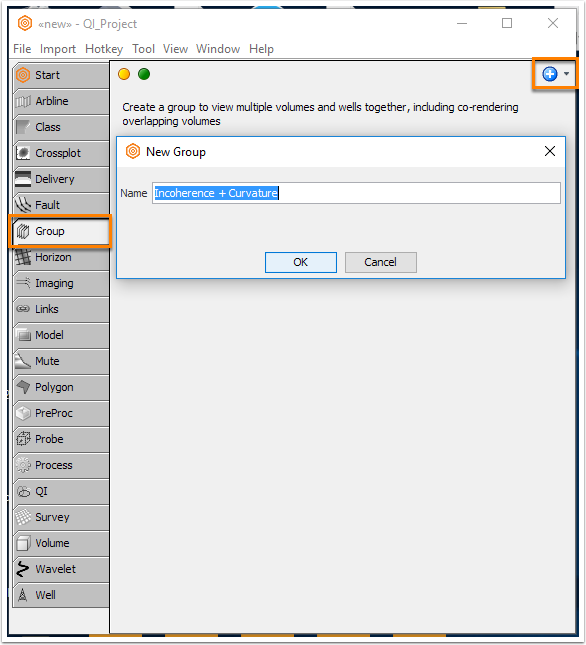 Creating a group in Insight gives you the ability to co-render volumes. 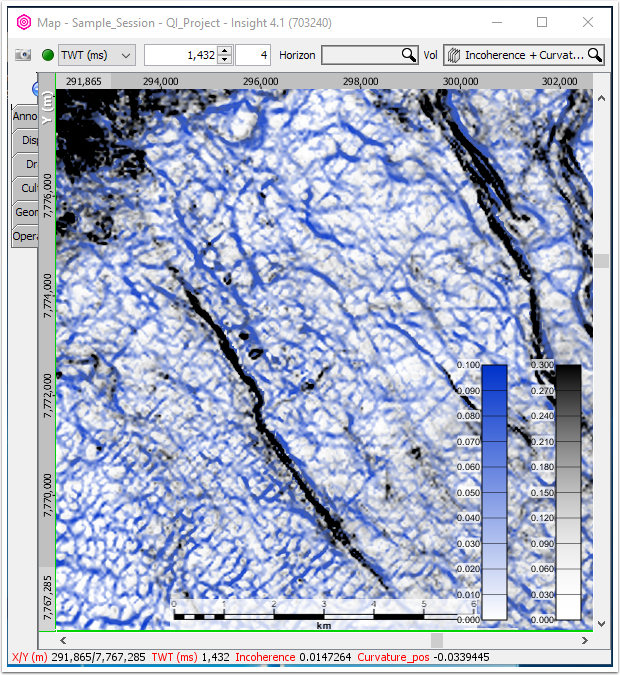 Groups allow for multiple volumes to be displayed in a map or section view, allowing characteristics captured by different attributes to be easily visualized. 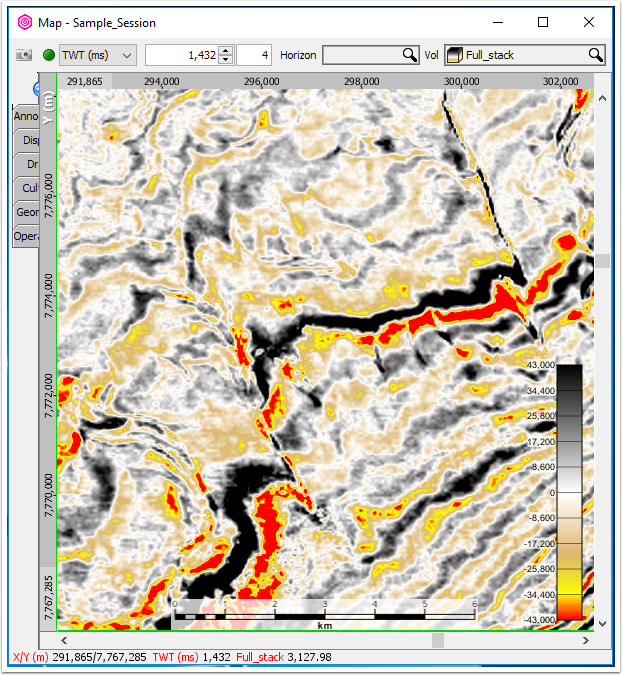 This is especially helpful when viewing amplitude and velocity data in the same view, displaying a 2D section covering multiple volumes, or viewing multiple seismic attributes. In the example below, we’ll show how incoherence and curvature volumes can be grouped to display structural features. 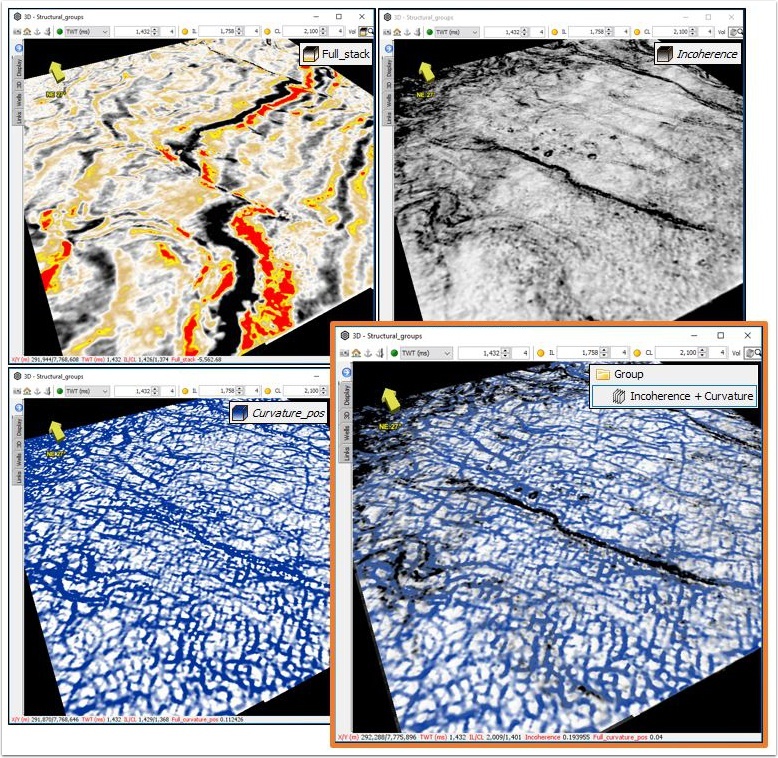 Grouping attribute volumes together is an excellent way to show different structural features that are elucidated using multiple processes. 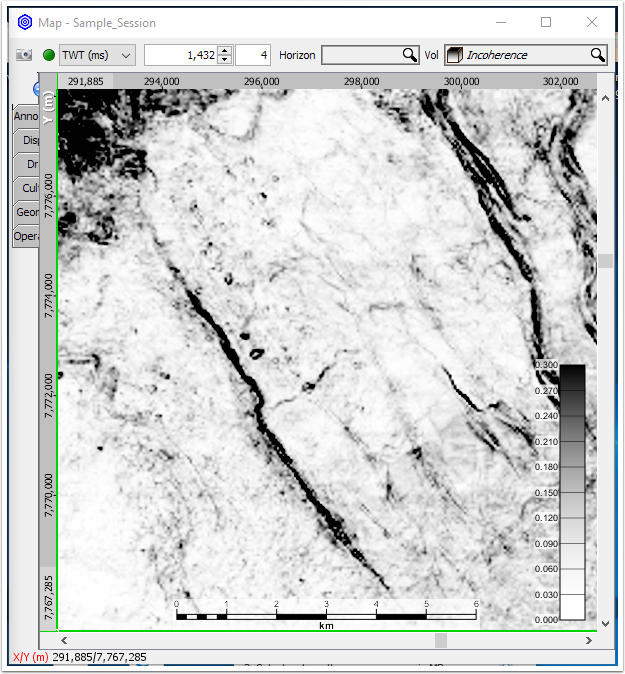 In this example, we’ll group an incoherence volume with a positive curvature volume to highlight faults, flexures, and potential fracture networks. 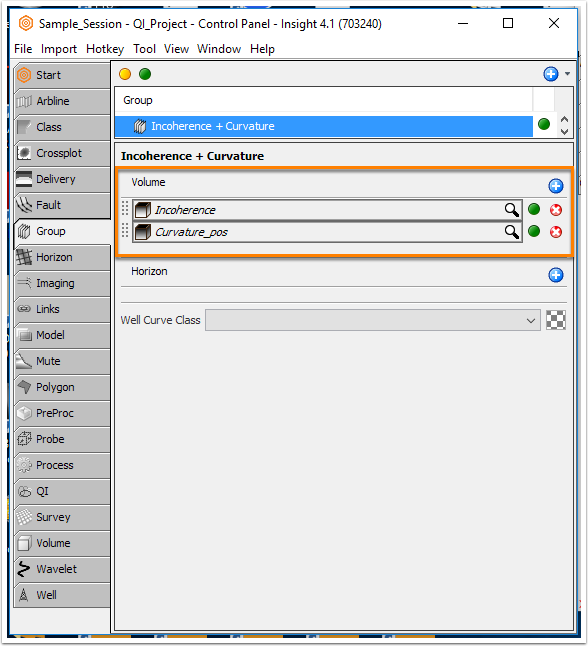 Using this workflow, any volumes can be grouped for display. Easily group velocity and stack data and display in section view. The image below shows a timeslice from a full stack volume which will be used as input for incoherence and curvature processes. 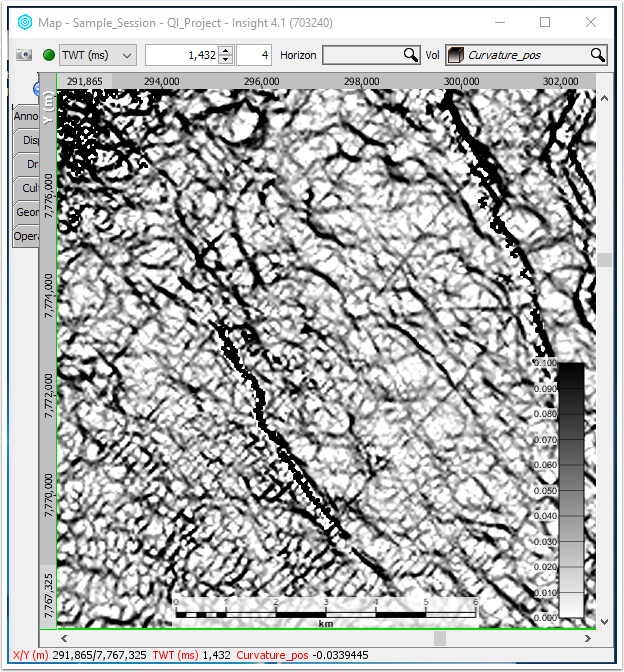 Incoherence, which measures trace discontinuity, is great for visualizing faulted areas where reflectors are offset . This makes for a clear image of fault intersections in Map view. The timeslice clearly shows two large faults with a NW-SE trend. While incoherence allows us to see features which have large trace-to-trace dissimilarity, more subtle features can be resolved using attributes which measure curvature, or rate of change in dip, along a reflector. 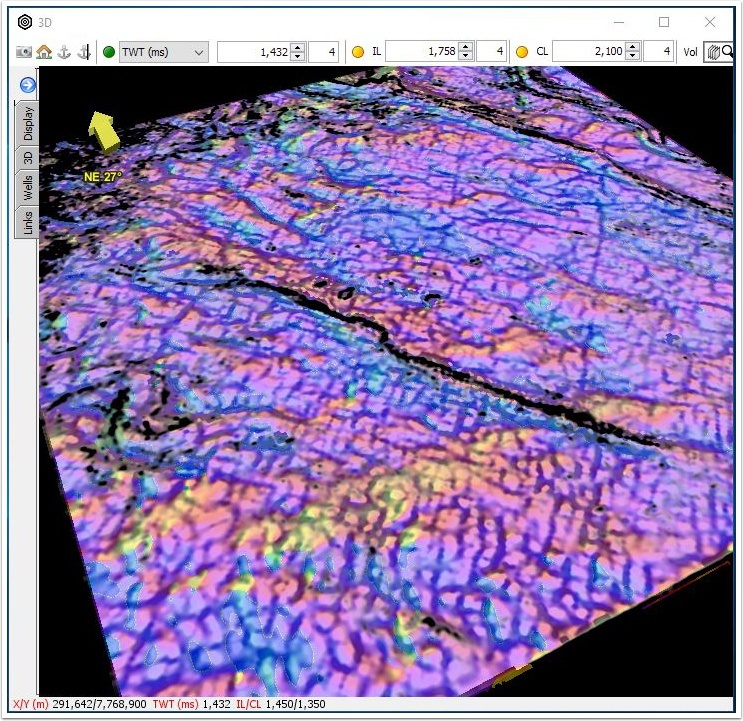 Geologic features which don’t display reflector offset, such as faults with offset below seismic resolution, small flexures, and potential fracture networks, are displayed well with curvature. The above timeslice from the positive curvature volume shows many features that are not resolved using incoherence. These include many potential fracture networks, along with some linear features oriented with the main fault trend which may be smaller faults. Using groups, we’ll create a display which combines the very continuous fault intersection display seen in the incoherence timeslice, with the detail seen in the positive curvature volume. On the Control Panel, select the Group tab and click the "+" to create a new group. Once you’ve given your group a name, click the "+" under volume to add the volumes you would like to have in your group. After you’ve added volumes, you can arrange the display order of the volumes by dragging and dropping the volume you would like to have on top above the other volume. In order for features highlighted from both volumes to be displayed, transparency will need to be adjusted on the top volume. Volume transparency can be set two ways, either by adjusting the Class Opacity using the slider, or by adjusting the colorbar opacity. Choosing which method to use depends on the data. 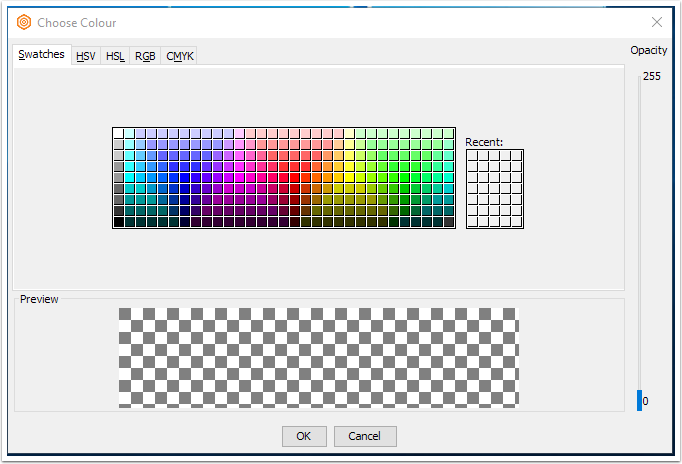 It may also be helpful to use different colorbars for each attribute. 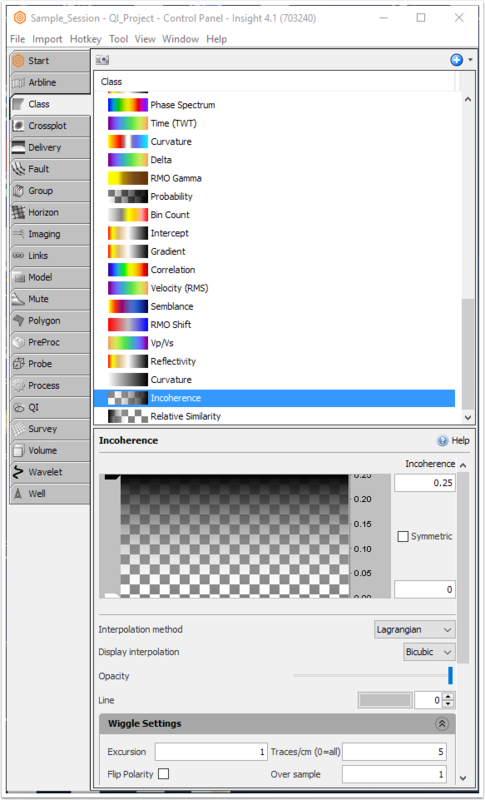 We’ll change the curvature volume’s colorbar to white to blue so that areas with high curvature are differentiated from areas with high incoherence. The image below shows a group with positive curvature as the bottom volume and incoherence as the top volume. The colorbar has been adjusted so that values with low incoherency appear transparent, allowing for areas with high positive curvature areas to be easily seen. This creates a display where the very incoherent values (faults) are clearly seen amongst features with high positive curvature (small faults, flexures, possible fractures). Co-rendering multiple volumes using Groups is a powerful way to create a display showing the structural complexity of an area. Insight’s ease of use allows for these displays to be created quickly while also giving the user plenty of control for customization. There’s no reason to stop at two volumes! In this last image, we’ve taken the approach further and included azimuth (of maximum dip) to highlight the direction of the structural trend.